is very pleased to announce that 50% of the works were sold on opening night. Don't miss your chance to see these amazing works before November 25th! 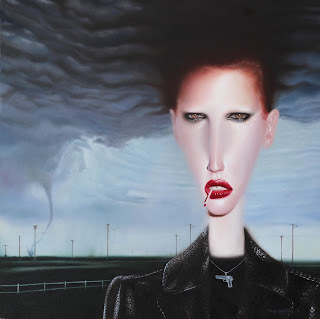 The Fates and the Furies is the fourth series from artist Troy Brooks. His paintings of surreal female characters have sparked a flurry of interest with Toronto art collectors. The complex women in his paintings weave haunted tales that escape merely one interpretation. "This show is my most diverse group of characters," says the artist. "The theme and the one thing that ties these women together is a sense of being divided. They are all experiencing a self-segregation." The Globe and Mail has called Troy's work "alluring, alarming" and "a shimmering cast of characters." The buzz is starting to grow around this exciting new emerging artist!